A two hour adventure in which two students experience all of the aspects of flight and flight preparation. 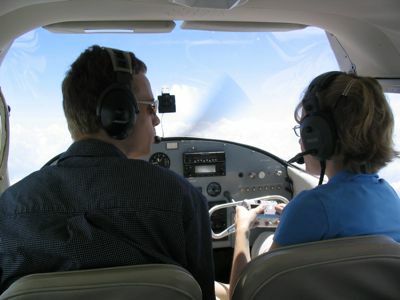 Upon arrival at the airport, an FAA Certified Flight Instructor is assigned and will explain all of the items a real pilot accomplishes before, during and after a typical flight. In this real flight lesson, the students will do all of the pre-flight procedures, taxi the aircraft, talk to the control tower, help make the takeoff, and once airborne, do many in-flight maneuvers. Of course, the instructor will be sitting next to them, instructing them to "push this" or "pull that", but they will do most of the flying! In this flight, they will depart from Chicago Executive Airport and fly Northeast to Waukegan Airport. Along the way they will fly over Highland Park, Historic Fort Sheridan, Lake Forest and Great Lakes Naval Base. upon landing at Waukegan Airport, the initial pilot will switch seats with the backseat passenger and they will get to do the return trip! A great way to share a flight lesson! This 2 - 2.5 hour lesson includes approximately 1 hour of flying time split between the two students. Note: If you would like to fly directly with our Chief Pilot, please select "Yes" to the "Fly with Chief Pilot option below. A $50 charge will apply to reservations with Chief Pilot.